The Metcalfe Group worked side by side with Vendor’s Exchange Global Vending to create two fully-functional vending machine doors with the goal of updating aesthetics and incorporating new technologies. The result generated lots of attention and positive reviews at the NAMA (National Automatic Merchandising Association) show in Las Vegas from those within the industry, due to its modern design and innovative technological elements. More than just a simple looks-like prototype, the machine was entirely functional, giving the user a true sense of what the final product would be. Gone is the boring ‘PUSH’ bucket door. Gone is the unexciting black exterior. Gone is the huge gap between the floor and bottom of the machine. Say hello to ample amounts of lighting, smooth surface transitions, interesting materials, and touch-screen capabilities. 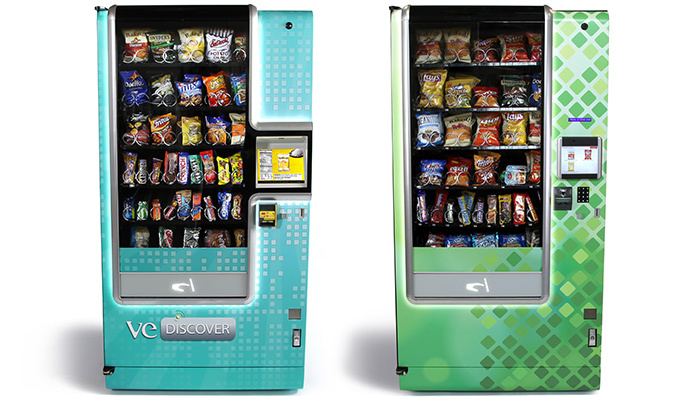 Our design has helped Vendor’s Exchange realize their goal of creating an exciting, innovative, and visually commanding vending machine that has already made waves in the industry. More information can be found on the Vendor’s Exchange site for the Discover and Curve Doors.